Preheat oven to 350 F. Roll out dough on lightly floured surface to a 12″ round and fit into a 9″ pie plate. Lightly prick bottom with a fork. Chill until firm, at least 30 minutes. Meanwhile, melt butter in a small saucepan over medium heat. Add brown sugar and whisk until smooth. Remove from heat and whisk in corn syrup, vanilla, zest and salt. Lightly beat eggs in a medium bowl, then whisk in corn syrup mixture. 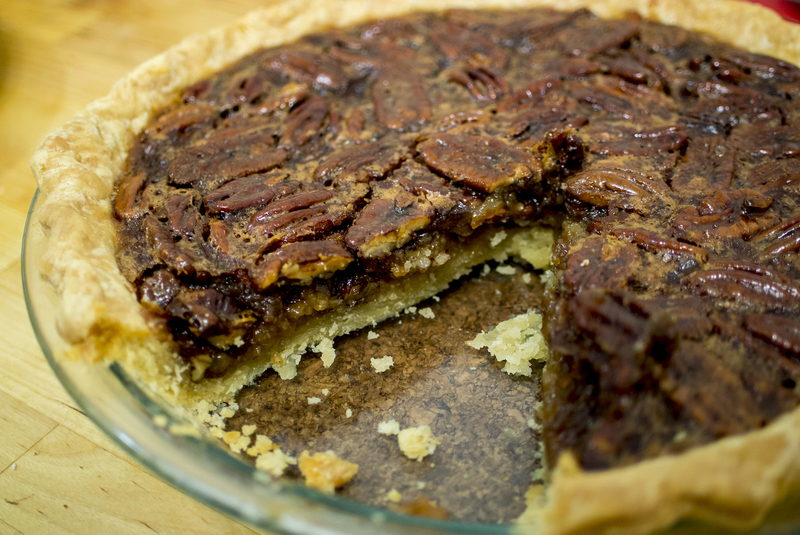 Put pecans in the pie shell and pour corn syrup mixture evenly over top. Bake in preheated oven until filling is set, about 50-60 minutes. Cool completely. This was a delightfully simple recipe to make and turned out to be delightfully delicious. Not too sweet with a light citrus note from the orange zest. A crunchy treat well-worth making again.